IS YOUR CAT URINATING OUT OF THE LITTERBOX? Judy describes real cases of cats who refused to use their litterboxes and were completely cured with the use of safe, non-toxic flower essences. litter boxes, cleaning them daily, to no avail. She then called me for help.After a thorough evaluation and “tuning in” to Scotty, I determined that his behavior stemmed from a previous urinary tract infection which had been medically resolved. However, Scotty had not resolved the trauma associated with that event. With only a single essence, Scotty stopped urinating on the carpet after just a couple of days! He never had another urinating accident. 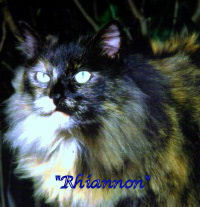 “RHIANNON”: Rhiannon, (pictured above) a 5 year old female Persian mix, had been an abandoned kitten. She was adopted at 6 weeks old, and lived happily with Mary and a male cat, Jack, in a small condo. All was peaceful until Mary introduced another rescued female cat - Justine. Justine was quite aggressive to the more submissive Rhiannon. Rhiannon reacted to the stress by urinating regularly on a small rug in Mary's apartment. This case was more complex than Scotty’s (above). Justine needed essences for her aggression, and Rhiannon needed essences to give her more courage and the ability to stand up for herself. Rhiannon also needed a number of other essences to address the various negative emotions she had about this new cat “invading” the household. The rug-peeing problem and the fighting abated after 3 sessions. A recurrence of the problem showed itself 9 months later. After a 4th round of essences, peace reigned in the household. No more dirty rugs, and no more cat spats! “INKY”: Inky was discovered at age 3 weeks, alone and dying, in a cactus in an empty lot. With much care, Inky was revived and gradually brought back to life. At age 5, he was a quite large and beautiful long-haired black cat – but with many problems. He had begun urinating on the floor and furniture on a daily basis, since age 3. He did not groom himself, liked being around people but hated being touched – he would bite ferociously when touched. In addition, he never purred, and did not groom himself and did not know how to play.Inky required essence sessions over an extended period of time. The first few sessions were every couple of weeks, and then about once every month or two. It’s taken time, but the changes in Inky have been astounding. Inky now uses his litterbox regularly. He enjoys being petted, purrs, and is even grooming himself and playing.